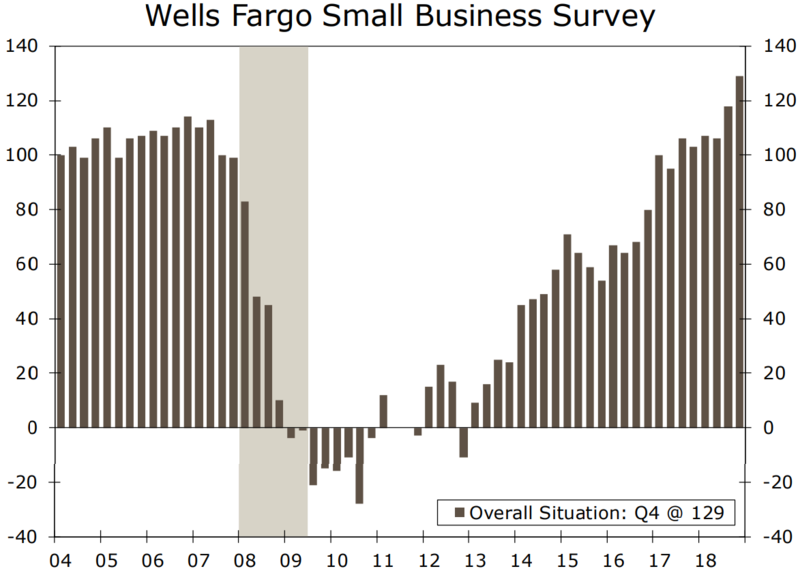 Small business owner confidence continued to improve this quarter, according to new data from Wells Fargo and Gallup. Specifically, the duo’s headline optimism gauge jumped to 129 during the final three months of 2018, an all-time high that suggests owners have not “been unnerved by the recent rise in trade tensions with China.” This makes sense since most small businesses in America derive the bulk of their revenue domestically, and therefore are less sensitive to tariffs and foreign demand. A prolonged trade war, though, could eventually take its toll on these firms but for now other concerns are more prevalent in owners’ minds. 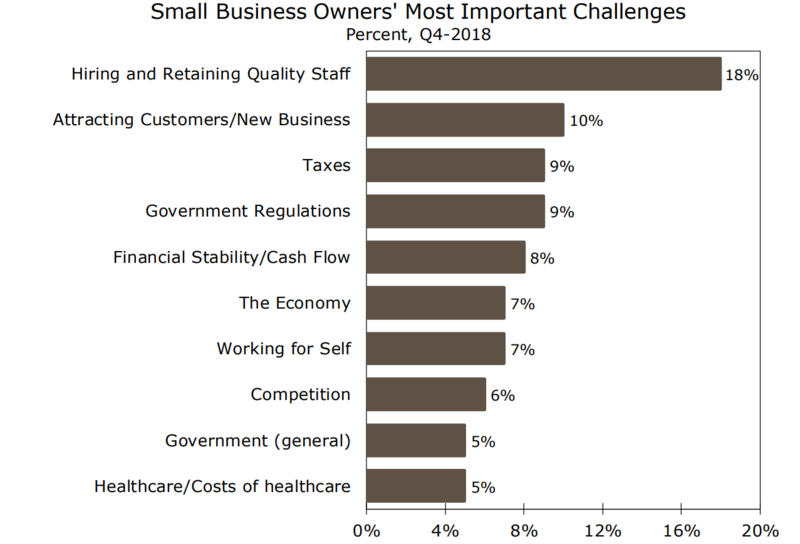 For example, “hiring and retaining quality staff” was by far the most frequently cited challenge for small businesses. 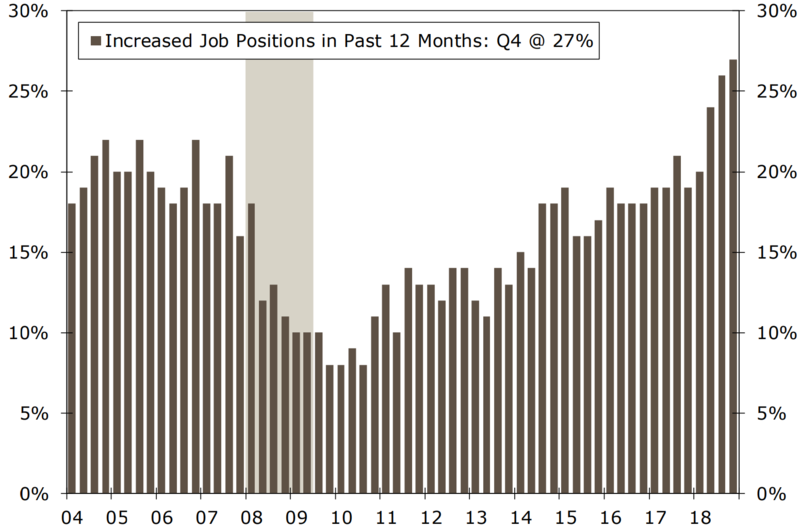 This was the third quarter in a row that owners have pointed to staffing as their top problem, which is to be expected when record-level hiring and a shortage of qualified applicants have together increased the competition for talent across all industries. These problems likely will not be going away anytime soon because more than one in three survey respondents said that they plan to continue boosting employment in 2019. This environment will be especially difficult for companies that cannot offer workers compensation packages (wages and benefits) as attractive as what can be found at other firms.